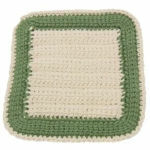 Bobble Stitch Toothpick Holder -- $1.99 A Crochet pattern from Julie A Bolduc. This toothpick holder is fast and easy to make and you can make it in an evening. It is made with an empty film container.